Our proposed solar farm north of Ingham would generate up to 13MW of electricity to feed directly into the local electrical grid network, generating enough renewable electricity to power up to 3,900 average UK homes. The solar farm would save up to 6,000 tonnes of carbon dioxide per annum, or 180,000 tonnes over the proposed 30 year life of the project. The site is approximately 51 acres/ 20 hectares of land north west of Ingham. The location proposed is well screened, over the brow of the hill, surrounded by existing mature hedges and trees and out of view from Ingham village. This proposal replaces the previous application for a solar farm by Gamma Solar. 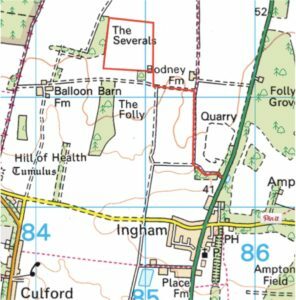 The new location north of the original site comes following feedback on the Gamma Solar scheme from the local community. The site location and access are outlined in red. The previous application area is shaded in light blue. The whole solar farm would lie within a single field of lower grade 3b agricultural land. Following on from the public consultation, the completion of the project team’s site analysis and the on-going pre-application discussion with St Edmundsbury Council officers, it is likely a planning application will be submitted later in the year. We operate a community benefit fund for all of our projects, which can sponsor a variety of local initiatives. We welcome suggestions for local projects to be considered; ideas include solar or heating projects in local buildings, educational projects and other projects that would benefit the community. As well as financial benefit, the solar farm would provide ecological and environmental benefits. A nectar-rich grass and wildflower mix would be introduced on the site, which would be grazed by sheep and be a haven for birds, bees and other wildlife. The project would pay significant business rates to the local authority and provide employment opportunities both during construction and in operation. Should the project be granted planning permission, we would look to use local suppliers where possible. The wide variety of businesses and individuals who may be able to work on the project include: electrical engineers, electrical supplies, maintenance, civil engineers, plant hire, security, local accommodation, site facilities, groundsmen, landscaping, nursery plants, solar panel cleaning, fencing contractors and haulage.